GENESI-DEC (Ground European Network for Earth Science Interoperations – Digital Earth Community) it is a project of the European Communities, which began in May 2010 and led by ESA. GENESI-DEC aims to develop and implement the concept of Digital Earth, an innovative idea which sees the Earth virtually represented as a set spatially georeferenced and interconnected to digital data warehouses worldwide distributed , which aims to concentrate in a single environment most terrestrial digital information actually available , the management of natural resources to the Earth sciences, from environmental monitoring to the different aspects of human society. The project aims to allow free access to data and services, helping European and world communities of Digital Earth access, produce and share data, information, products and knowledge. 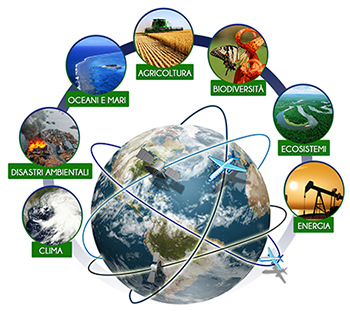 GENESI-DEC constituting a multi-dimensional structure, multi-temporal and multi-layers of enormous value, goes to be an effective tool to address global challenges such as biodiversity, climate change, pollution and sustainable development. GENESI-DEC integrates and develops its predecessor project GENESI-DR, aiming to include the broadest and most diverse digital scientific community (the so called Digital Earth Communities), to provide specific services for each community and to encourage the sharing of data to stimulate collaboration. To expand existing infrastructure in existing GENESI-DR, expanding them in terms of availability of resources and geographic extension. To deliver reliable services, providing easy and efficient access to a variety of data structures, tools and services in the various fields of environmental science, ensuring safety and quality. To reduce the solutions fragmentation , enabling you to take advantage of some of the most important terrestrial digital data infrastructures from a single access point. To allow multidisciplinary collaboration, stimulating dialogue between different digital scientific community. To stimulate, educate and support the creation of scientific research community in the field of Digital Earth. GENESI-DEC involving key partners of the ESFRI projects and collaborates with key players in the Digital Earth world, including the International Society of Digital Earth (ISDE) and GEO-GEOSS. What is the role of the National Geoportal in the GENESI-DEC project? The National Geoportal aims to promote and spread the use of Geographic Information Systems within the scientific community and beyond, allowing free access to most of the map information for environmental and territorial character available today on the Italian national territory. In this context, the Geoportal contributes to GENESI-DEC project as the largest database of environmental and spatial information made available through WMS (Web Map Services). Interoperability with the GENESI-DEC Portal means that the National Geoportal WMS services are accessible directly from the infrastructure GENESI-DEC: in this way, users can benefit from the complementary capabilities of the information collected through these services with other data relevant made available by the system. How can you access the National Geoportal WMS catalogue from GENESI-DEC Portal? The user can access the portal by taking advantage of the GENESI-DEC putting links available through the button at the top right, or by navigating to http://portal.genesi-dec.eu/ and accessing the “start” section. Adding the layer to your library with “Add to My Date” you can view the data directly on the viewer GENESI-DEC, along with the other data of interest added to your library. By clicking on the KML icon you can download the KML format of the data. RDF clicking on the icon you can see the associated metadata, from which you can extract the url (online resource) required the use of the WMS service. Clicking on the “WMS Layer in image / png” is displayed a preview of the data. 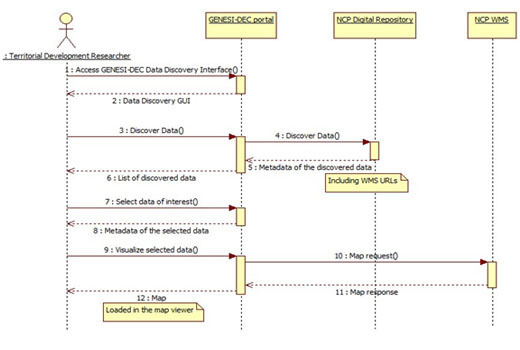 The extents of the selected spatial data is shown in the viewer of the GENESI-DEC portal. The system responds with a list of data that match the search criteria defined: select data of interest through the found records. Choose the region and the interest of time, using the tools provided in the text field specifying the type of data you look between the various made available in the catalog WMS (eg display WMS services, eg “protected natural areas”). Access the GENESI-DEC Portal, and interact with the graphic interface of the viewer. The basic flow described above is represented by the sequence diagram in Figure 1, which depicts the infrastructure and resources involved, providing an overview of actions to be performed in the system to obtain the expected response to each step. Fig. 1 – Sequence of operations required to display WMS services of the National Geoportal infrastructure GENESI-DEC. The project includes a number of international partners, such as: the National Geoportal of the Ministry of Environment, Land and Sea, the JRC – Joint Research Centre of the European Commission (Belgium), the IT Innovation Centre / University of Southampton (United Kingdom), Terradue (Italy) Telespazio (Italy), DLR (Germany), MARIS – Mariene Informatie Service (Netherlands), the National Institute of Geophysics and Volcanology – INGV (Italian), the Elasg Datamat (Italy).